Don’t let their heavy winter coat fool you; raccoons still want a warm, cozy place to den. Ahhhh… the winter den… a softly lit, cozy room with a comfy reading chair, a warm blanket, and a cup of hot cocoa, coffee, or tea. These winter creature comforts differ a bit if you’re a small wild animal, but warmth is equally valued, and a winter den provided by a tree or other natural feature can be increasingly hard to find due to habitat loss and urbanization. As temps begin dropping, there’s more wildlife looking for warmth than there are so-called “natural” denning spots available, so, you may discover, “Yikes! 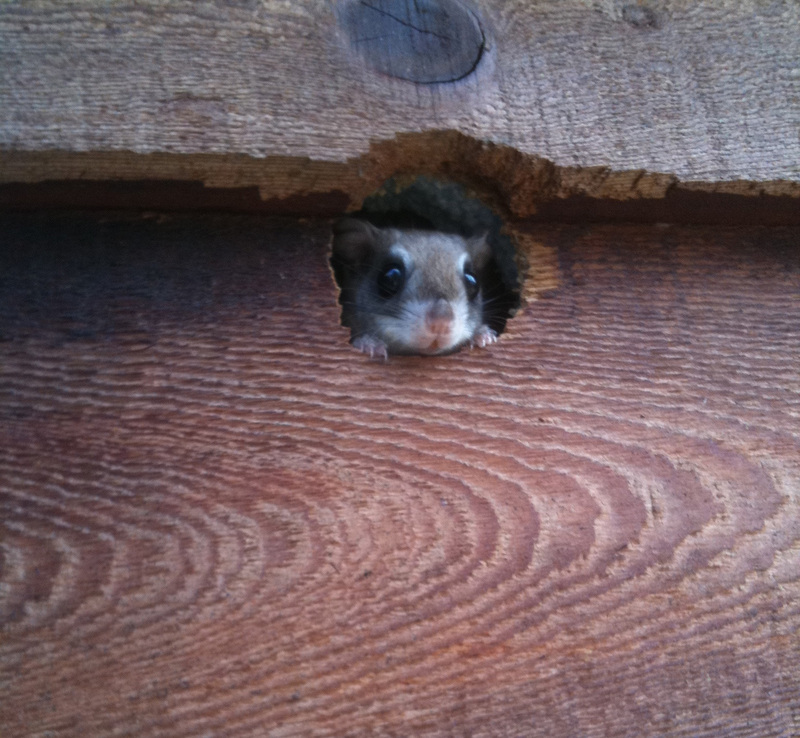 There’s an animal in my attic!” Or, a surprise encounter may cause you to wonder, “Why are there animals in my shed?” These animals are only trying to make the best of a difficult situation. If you hear noises as you approach your garage, you may suspect, “Hey, I think there’s an animal in my garage!” But take time to consider the situation before forcing an animal to leave in the dead of winter. Your choice of action could save an animal’s life. Let’s talk about some of these scenarios and some effective ways to resolve them without causing unnecessary harm to wildlife or exacerbating the problem for you. You will hear squirrels as they come and go from their winter dens. For most of us, attics are not appealing as a place to hang out. 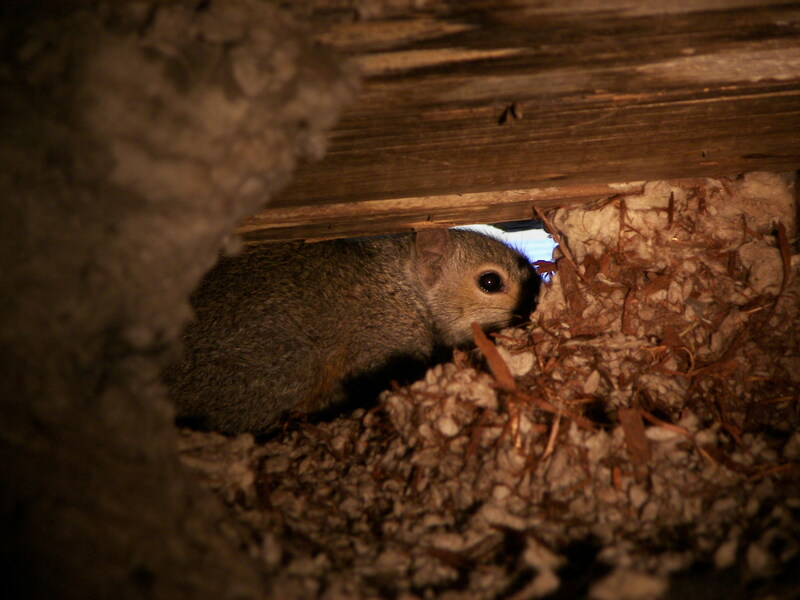 But for a bat seeking a warm, safe place to hibernate—or for a tree squirrel or flying squirrel looking for a winter den—your attic is a lucky find for them, but not so lucky for you. Figuring out the best way to get animals out and keep them out is important, but before attempting to evict an animal make sure to check with your state wildlife agency for pertinent laws and timing of wildlife activities in your area. Waiting till spring is the appropriate course of action with hibernating animals. In cases where waiting may present health or safety risks, hire a humane and responsible professional who can help achieve the best resolution for both you and the animals. Bats: In winter, bats will be hibernating and will cause no problems for you. Thus, the best times to evict them are early autumn or early spring. It can be complicated to evict a bat colony, so you may want to get a recommendation from your state wildlife agency or wildlife center for a professional who can help you. Make sure they plan to follow guidelines set forth by Bat Conservation International. Follow up with thorough efforts to seal the tiny entrances that allowed them into your home. Look for spots around windows, gables, attic vents, deteriorated siding, etc. 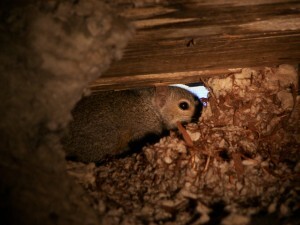 Squirrels: Tree squirrels are active in the day, so you’ll hear noises as they come and go. They have a second litter in fall and often have dependent young through the winter season, another reason they seek shelter in your attic. Flying Squirrels: Flying squirrels are active at night. In winter, 10-20 flying squirrels make seek shelter together in an attic to escape the harsh weather and they may cache significant quantities of food here as well. You’ll most likely hear them during the two hours after sunset or the two hours before sunrise. Squirrels of all kinds need to constantly chew things to wear down perpetually growing front teeth, so there is a potential hazard of them being in your attic and chewing on wires. If you have these animals in your attic, have an electrician inspect the wiring for damage and make any necessary repairs. Eviction should be done humanely, ensuring that all animals are safely out and that any dependent young are reunited with their mothers before entrances are permanently sealed. A wild animal may choose a garage or shed as shelter in winter, particularly if the location and structure allow for coming and going discreetly. If you’re thinking, “I really cannot allow animals in my shed or an animal in my garage,” and you feel there’s a need to evict them before spring, try to do so when your area is not experiencing particularly harsh weather conditions, so the animal will have a chance to find other shelter. Definitely check with your state wildlife agency for pertinent laws and timing for the species involved, including when dependent young might be present. 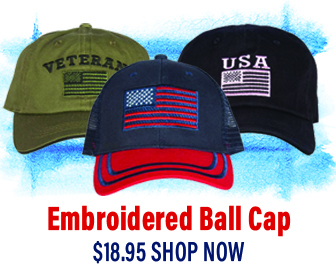 Consider hiring a professional for a humane and effective outcome. 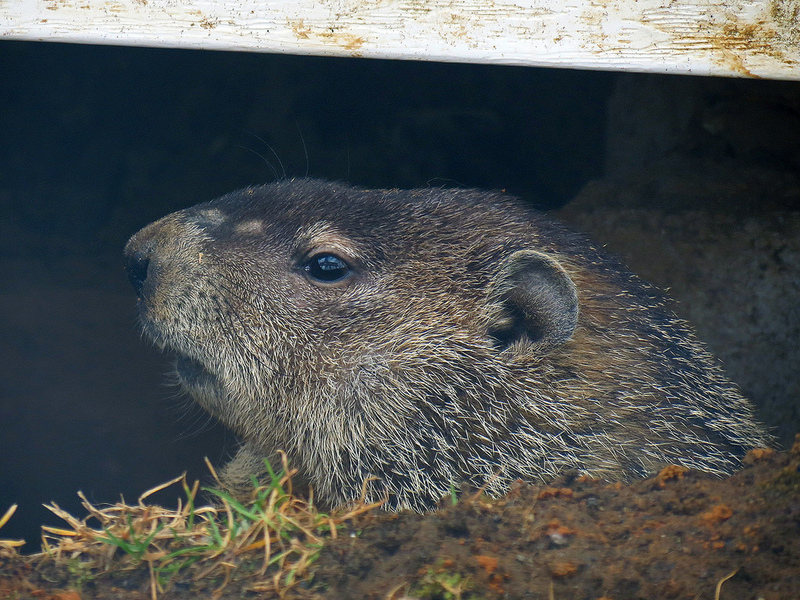 Woodchucks often choose to excavate their winter dens underneath shed, porches, or decks. 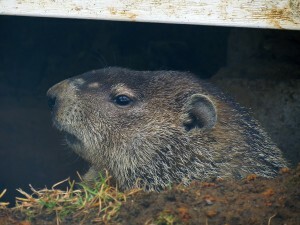 A more typical scenario is for wildlife to excavate a winter den underneath a shed or porch. Such burrows may be for a hibernating woodchuck or for a non-hibernating animal, such as a skunk or an opossum. Woodchucks spend summer and fall fattening up so they can slumber through the winter in deep hibernation. These animals can surely be left in peace until spring comes. If needed, a little gentle harassment in the early spring—before they have young to care for—will likely send them on their way to find a more peaceful place to den. Since skunks and opossums do not hibernate, it’s understandable that their comings and goings might create some excitement if you have pets. First, see if there is any way you could mitigate the likelihood of interactions. If not, they may need to be encouraged to leave. 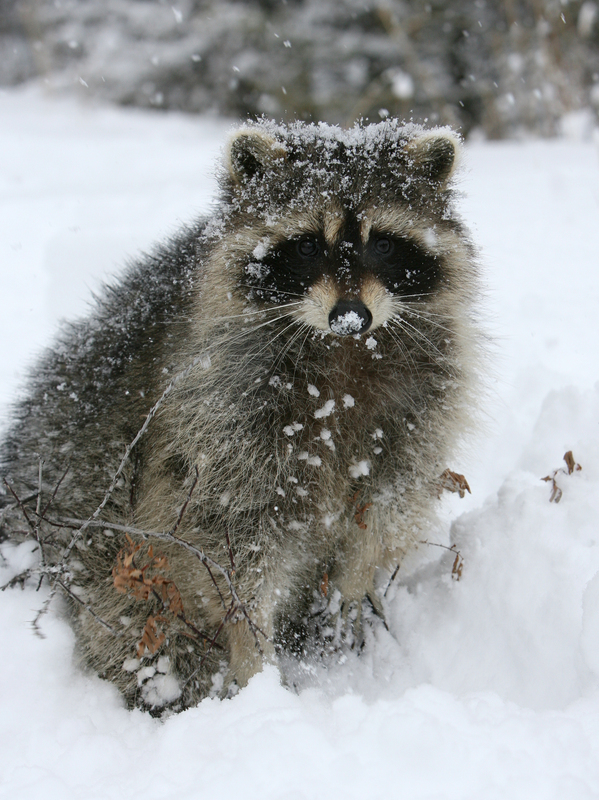 Otherwise, however, there’s rarely a true need to evict these animals in winter. When warm weather comes, check with your state wildlife agency about appropriate timing for doing gentle harassment to evict animals from places where they’re problematic for you. Loosely fill burrow entrances with leaves or straw. As the animals move the material when they come and go, you replace it. When the material remains in place for three nights of mild weather, you can assume they’ve left. If they need more encouragement, play a radio loudly or flash lights into the entrance. Lastly, try putting a little used kitty litter in the entrance. That’s usually more than enough to make them decide they need a new place. Once they’re out, seal up the entrances to ensure others don’t come along and claim the space. Eliminate any food attractants like pet food in dishes on your deck or spilled birdseed piling up under feeders or around containers. Trim branches that overhang your roof. Move brush piles to the farthest point possible from your house. Inspect your home’s exterior often and keep up with needed repairs. Be on the lookout for wildlife at key times when they might be trying to find their way in, such as before winter and when they need shelter for raising their young.